The Berliner Freiheit is situated on the grounds of the Beisheim Center on Potsdamer Platz. During the roaring twenties, it was one of the liveliest spots in Europe but fell into unsightly ruin when the Iron Curtain fell in 1961. After the fall of the Berlin Wall in 1989 it reawakened to new life and, within only a few years, had regained its status as an urban centre of international standing. The new heart of the city on the Spree enjoys great popularity – whether amongst the business community, for international cultural events such as the Berlinale, or with the numerous guests of the nearby The Ritz-Carlton Berlin and Berlin Marriott Hotel. 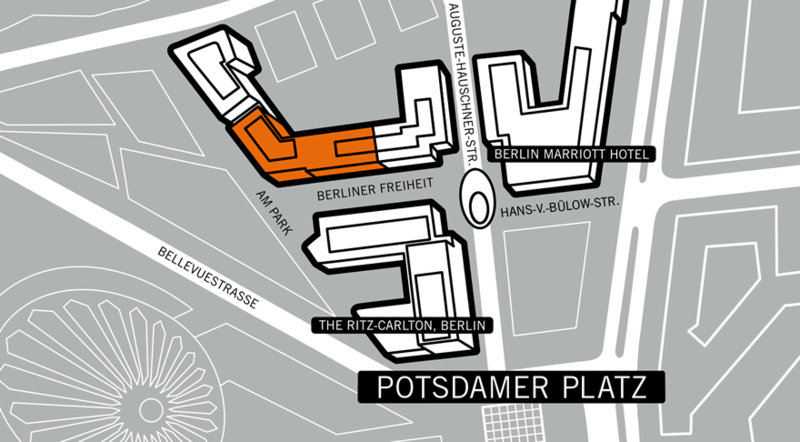 The event location is immediately adjacent to the Sony Center, the DaimlerChrysler complex and Leipziger Platz. The Tiergarten, which covers an area of 210 hectares, the Kulturforum with its philharmonic orchestra and New National Gallery, and the Brandenburg Gate are all within walking distance. Government institutions, Länder representations and embassies are in the immediate vicinity.